The Parish has a number of old routeways. The Banbury Lane which runs along the Northern Boundary is part of the old Jurassic way which ran from the Humber to the Avon near Bristol. it was not a made up road but rather a wide open track leading where possible across high ground, such as the Northamptonshire wolds, so as to keep away from the muddy river valleys. Local towns, villges and religious houses were linked by green lanes, such as the Bridle Path to Weston and the Magpie/Helmdon Road. The hedges were wide apart giving plenty of room to drive sheep and cattle. Although not surfaced for wheeled vehicles they became hardened down by the constant tread of feet. The merchants, their pannier horses laden with merchandise, and travellers, pilgrims, friars, cattle, sheep and horses, all passed along these winding lanes on their business or pleasure, and many such tracks form the basis of our road system today. The Welsh Lane which begins in the Welsh hills and ends in London, enters the parish from Culworth, where it crosses the Banbury Lane and skirts the western edge of Suglrave on its way to the main Northampton-Oxford road. This is an old drovers' road. From the late 15th and early 16th centuries Welsh store cattle were driven down these roads to the rich fattening pastures of Leicestershire and Northamptonshire and thence to the markets of London. 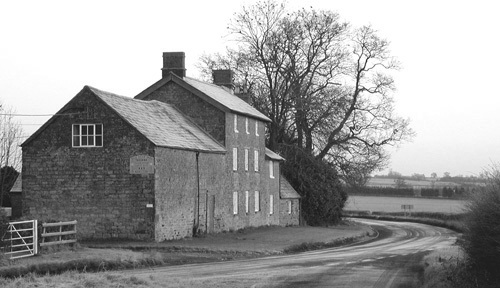 The typical Northamptonshire three-storey farmhouse known as The Magpie at the top of the Parish was a drovers' inn. Opposite the junction of the Welsh Lane with Magpie Road is a small triangular field which was a 'stance' where the cattle could be penned at night whilst the drover spent the night refreshing himself in the hostelry! The Magpie Farmhouse, formerly a drovers' inn.